Image modified from Lava glow and space at the Kilauea volcano. Credit: Andreas Johnsson (distributed via imaggeo.egu.eu). There is no doubt that 2018 was packed full of exciting, insightful and informative blog posts. An impressive 382 posts were published across the EGU’s official blog, GeoLog, as well as the network and division blogs! In December, to celebrate the excellent display of science writing across the network and division blogs, we launched the EGU Blogs competition. From a list of posts selected by our blog editors, we invited you, the EGU Blogs readers, to vote for your favourite post of 2018. We also invited EGU division blog editors and office staff to take part in a panel vote. After more than two weeks of voting, the winners are finally in! Without further ado, we’d like to extend a big congratulations to the Geodynamics (GD) Division Blog, winner of the public vote, and the Geology for Global Development (GfGD) Blog, winner of the panel vote! The GD division blog was crowned winner of this year’s public vote for their post on the Global Young Scientists Summit (GYSS) in Singapore! Follow blog contributor Luca Dal Zilio’s experience attending this gathering of over 250 PhD and postdoctoral fellows! The GfGD blog snagged first place in the panel vote with their post: The Case Against Fieldwork – How can we internalise the carbon cost of fieldwork, as scientists who investigate the earth system? Read blog contributor Robert Emberson’s analysis and personal experience with the carbon footprint of working in the field! All the posts entered into the competition are worthy of a read too, so head over to the poll and click on the post titles to learn about a variety of topics: from social media responses to geomagnetic activity, to exploring what artificial intelligence can do for climate science and watching socio-hydrology on Broadway. If the start of a new year, with its inevitable resolutions, along with the range and breadth of posts across the EGU Blogs have inspired you to try your hand at a little science writing then remember all the EGU Blogs welcome (and encourage!) guest posts. Indeed, it is the variety of guest posts, in addition to regular features, which makes the blogs a great read! If you would like to contribute to any of the network, division blogs or GeoLog, please send a short paragraph detailing your idea to the EGU Communications Officer, Olivia Trani at networking@egu.eu. The past 12 months has seen an impressive 382 posts published across the EGU’s official blog, GeoLog, as well as the network and division blogs. From an Easter-themed post on the convection of eggs, features on mental health in academia, commentary on the pros and cons of artificial coral reefs, advice on presenting research at conferences, through to a three-part “live-series” on the Arctic Ocean 2018 expedition, 2018 has been packed full of exciting, fun, insightful and informative blog posts. To celebrate the excellent display of science writing across the network and division blogs, we are launching the EGU Blogs competition. We’ve asked our blog editors to put forth their favourite post of the year in the running to be crowned the best of the EGU blogs. 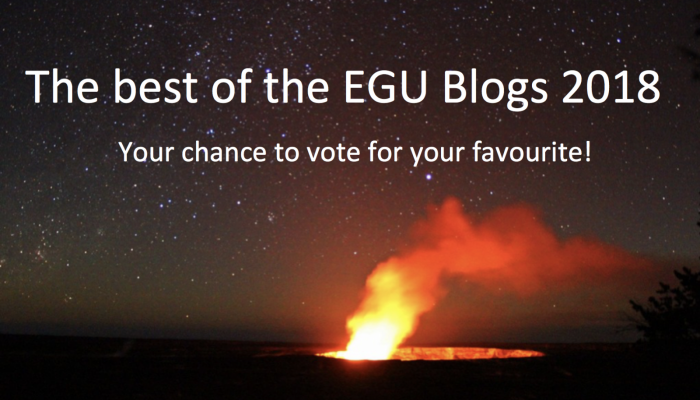 From now until Monday 14th January, we invite you, the EGU Blogs readers, to vote for your favourite post of 2018. Take a look at the poll below with the shortlisted posts, click on the titles to read each post in full, and cast your vote for the one you think deserves the accolade of best post of 2018. The post with the most votes by will be crowned the winner of the public vote. EGU blog editors and staff will also choose their favourites; the post with the most votes from this group will be deemed the winner of the panel vote. Which is the best EGU blog post of 2018? Cast your vote! Not only have the blogs seen some great writing throughout the year, they’ve also continued to keep readers up to date with news and information relevant to each of our scientific divisions. The portfolio of division blogs has expanded this year, with the addition of the Natural Hazards (NH) and the Stratigraphy, Sedimentology and Palaeontology (SSP) blogs last December and March respectively. Since then, they’ve featured posts on many interesting topics, including xenoconformity, research on how bacteria slime can change landscapes, documenting the lives of people exposed to volcanic risk, and geoethics. Are you a budding science writer, or want to try your hand at science communication? All the EGU Blogs, from GeoLog (the official EGU blog), through to the network and division blogs, welcome guest contributions from scientists, students and professionals in the Earth, planetary and space sciences. It couldn’t be easier to get involved. Decide what you’d like to write about, find the blog that is the best fit for your post and contact the blog editor – you can find all editor details on the individual blog pages. If in doubt, you can submit your idea for a post via the Submit a Post page on GeoLog, or email the EGU Communications Officer, Olivia Trani, who can help with initial enquiries and introduce you to individual blog editors. Don’t forget to a look at the blog pages for a flavour of the content you can expect from the new, and existing, blogs in 2019. The blogs are also a great place to learn about new opportunities, exciting fields of research and keep up to date with news relating to the upcoming 2019 General Assembly. Editor’s note on the EGU Best Blog Post of 2018 Competition: The winning post will be that with the most votes on 14th January 2019. The winner will be announced on GeoLog shortly after voting closes. The winning posts will take home an EGU goodie bag, as well as a book of the winners choice from the EGU library (there are up to 3 goodie bags and books available per blog. These are available for the blog editor(s) – where the winning post belongs to a multi-editor blog, and for the blog post author – where the author is a regular contributor or guest author and not the blog editor). In addition, a banner announcing the blog as the winner of the competition will be displayed on the blog’s landing page throughout 2019. We have two vacancies for science-communication or science-journalism students in Europe to work at the press centre of the 2019 General Assembly, which is taking place in Vienna, Austria, from 7–12 April. Applications from geoscience students with experience in science communication are also very welcome. This is a paid opportunity for budding science communicators to gain experience in the workings of a press office at a major scientific conference, and to interact with journalists. The students will join the team assisting the EGU Media and Communications Manager Bárbara Ferreira and the journalists at the press centre, and are expected to help run press conferences. Other tasks include reporting on the events at the Assembly through photographs and video (including producing a highlights video of the conference), and/or writing blog posts. The position is open to university students (final-year undergraduates or postgraduates) in science communication/journalism or to students in the Earth, planetary or space sciences with experience in science outreach. Applicants must have experience in photo and video reporting, or science writing, have an expert command of English, and be competent working with computers and the internet. Only students with a student ID card and an EU (including UK but except Croatia) or Swiss passport are allowed to work at the EGU General Assembly. People who are presenting an abstract at the EGU General Assembly are not eligible to apply. Tax regulations in your home country could obligate you to pay income taxes on the amount earned at the EGU General Assembly (including travel money). The respective taxation is your responsibility. If you have other income in Austria in 2019, you will be forced to pay income taxes in Austria should the sum of all income, including the amount earned at the EGU General Assembly (including travel money), exceed €11,000 gross. Press assistants will need to be in Vienna from Sunday 7 April in the early afternoon until late on Friday 12 April. They should expect to work between 50 and 55 hours and will receive a wage of €9/hour, in addition to a €150 allowance for those who don’t reside in Vienna (the city of your university is considered your current place of residence). Student press assistants also receive additional support towards travel expenses and complimentary breakfast and lunch at the press centre from Monday to Friday. Two samples of recent science communication work such as photo features, videos or written articles (published or unpublished, aimed at a general audience; links to an online portfolio are welcomed). Application documents (in English) should be submitted by email in a single file to Bárbara Ferreira at media@egu.eu. Bárbara can also be contacted for informal enquiries by email or phone (+49-89-2180-6703). The deadline for applications is 10 December 2018. If your application is successful, you will be asked to fill in a form to submit some information about yourself (including a copy of your passport and student ID card) to our conference organiser Copernicus. The European Geosciences Union (EGU, www.egu.eu) is Europe’s premier geosciences organisation, dedicated to the pursuit of excellence in the Earth, planetary, and space sciences for the benefit of humanity, worldwide. 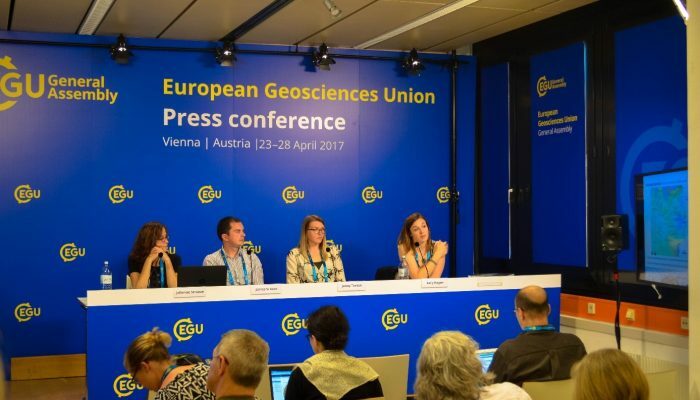 The EGU organises a General Assembly that attracts over 14,000 scientists each year, as well as reporters. The meeting’s sessions cover a wide range of topics, including volcanology, planetary exploration, the Earth’s internal structure and atmosphere, climate, as well as energy and resources. Robert shares details about what he learned while working as associate editor at Nature Geoscience . Credit: Lum3n.com (distributed via pexels). Editors of scientific journals play an important role in the process research publication. They act as the midpoint between authors and reviewers, and set the direction of a given journal. However, for an early career scientist like me (I only defended my PhD in early December 2016) the intricacies of editorial work remained somewhat mysterious. Many academic journals tend to appoint established, more senior scientists to these roles, and while most scientists interact with editors regularly their role is not commonly taught to more junior researchers. I was fortunate to get the chance to work, short term, as an associate editor at Nature Geoscience in the first 4 months of this year (2017). During that time, I learned a number of lessons about scientific publishing that I felt could be valuable to the community at large. What does an editor actually do? The role of the editor is often hidden to readers; in both paywalled and open-access journals the notes and thoughts editors make on submitted manuscripts are generally kept private. One of the first things to appreciate is that editors judge whether a manuscript meets a set of editorial thresholds that would make it appropriate for the journal in question, rather than whether the study is correctly designed or the results are robust. I’d argue most editors are looking for a balance of an advance beyond existing literature and the level of interest a manuscript offers for their audience. At each step of the publication process, from initial submission, through judging referee comments, to making a final decision, the editor is making a judgement whether the manuscript still meets those editorial thresholds. The vast majority of the papers I got the chance to read were pretty fascinating, but since the journal I was working for is targeted at the whole Earth science community some of these were a bit too esoteric, and as such didn’t fit the thresholds we set to appeal to the journal audience. I actually found judging papers on the basis of editorial thresholds refreshing – in our capacity as peer reviewers, most scientists are naturally sceptical of methodology and conclusions in other studies, but as an editor in most cases I was able to take the authors conclusions at face-value, and leave the critical assessment to referees. That’s where the important difference lies; even though editors are generally scientists by training, since they are naturally not experts in every field that they receive papers from, it’s paramount to find reviewers who have the appropriate expertise and to ask them the right set of questions. In journals with academic editors, the editors may have more leeway to make critical comments, but impartiality is key. Much of this may be already clear to many readers, but perhaps less so to more junior scientists. Many of the editorial decisions are somewhat subjective, like gauging the level of interest to a journal audience. In the context of open access research journals, I think it’s worth asking whether the editorial decisions should also be made openly readable by authors and referees – this might aid potential authors in deciding how to pitch their articles to a given journal. This feeds into my next point – what are journals looking for? By which metrics do journals judge studies? The second big thing I picked up is that the amount of work does not always equate to a paper being appropriate for a given journal. Invariably, authors have clearly worked hard, and it’s often really tricky to explain to authors that their study is not a good fit for the journal you’re working for. Speaking somewhat cynically, journals run for profit are interested in articles that can sell more copies or subscriptions. Since the audiences are primarily scientists, “scientific significance” will be a dominant consideration, but Nature and subsidiary journals also directly compare the mainstream media coverage of some of their articles with that of Science – that competition is important to their business. Many other authors have discussed the relative merits of “prestige” journals (including Nobel prize winners – https://www.theguardian.com/science/2013/dec/09/nobel-winner-boycott-science-journals), and all I’ll add here is what strikes me most is that ‘number of grad student hours worked’ is often not related to those articles that would be of a broader interest to the more mainstream media. The majority of articles don’t attract media attention of course, but I’d also argue that “scientific significance” is not strongly linked to the amount of time that goes into each study. 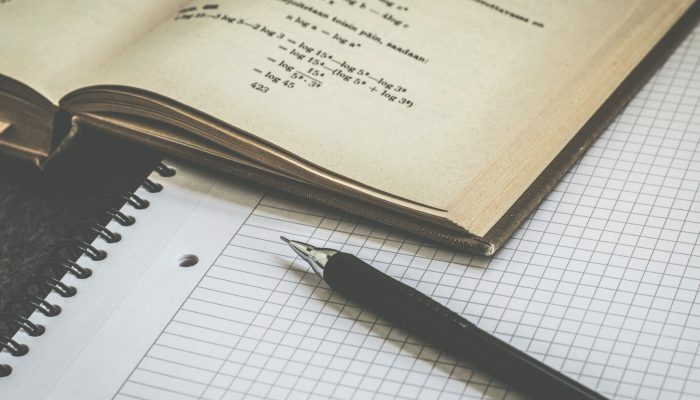 In the long run, high quality science tends to ensure a strong readership of any journal, but in my experience as an editor the quality of science in submitted manuscripts tends to be universally strong – the scientific method is followed, conclusions are robust, but in some cases they’re just pitched at the wrong audience. I’d argue this is why some studies have found in meta-analysis that in the majority of cases, articles that are initially rejected are later accepted in journals of similar ‘prestige’ (Weller et al. 2001, Moore et al. 2017). As such, it’s imperative that authors tailor their manuscripts to the appropriate audience. Editors from every journal are picking from the same pool of peer reviewers, and so the quality of reviews should also be consistent, which ultimately determines the robustness of a study; so to meet editorial thresholds, prospective authors should think about who is reading the journal. It’s certainly a fine line to walk – studies that are confirmatory of prior work tend to attract fewer readers, and as such editors may be less inclined to take an interest, but these are nonetheless important for the scientific canon. In my short time as an editor I certainly didn’t see a way around these problems, but it was eye-opening to see the gears of the publication system – the machine from within, as it were. One of the most time-consuming jobs of an editor is finding referees for manuscripts. It generally takes as long, if not far longer, than reading the manuscript in detail! The ideal set of referees should first have the required set of expertise to properly assess the paper in question, and then beyond that be representative of the field at large. Moreover, they need to have no conflict of interest with the authors of the paper. There are an awful lot of scientists working in the world at the moment, but in some sub-fields it can be pretty hard to find individuals who fit all these categories. For example, some studies in smaller research fields with a large number of senior co-authors often unintentionally rule out vast swathes of their colleagues as referees, simply because they have collaborated extensively. Ironically, working with everyone in your field leaves no-one left to review your work! I have no doubt that the vast majority of scientists would be able to referee a colleagues work impartially, but striving for truly impartial review should be an aim of an editor. As mentioned above, finding referees who represent the field is also important. More senior scientists have a greater range of experience, but tend to have less time available to review, while junior researchers can often provide more in-depth reviews of specific aspects. Referees from a range of geographic locations help provide diversity of opinion, as well as a fair balance in terms of gender. It was certainly informative to compare the diversity of authors with the diversity of the referees they recommended, who in general tend to be more male dominated and more US-centric than the authors themselves. A positive way of looking at this might be that this represents a diversifying Earth science community; recommended referees tend to be more established scientists, so greater author diversity might represent a changing demographic. On the other hand, it’s certainly worth bearing in mind that since reviewing is increasingly becoming a metric by which scientists themselves are judged, recommending referees who are more diverse is a way of encouraging a more varied and open community. Editorial work is definitely rewarding – I certainly felt part of the scientific process, and providing a service to authors and the readership community is the main remit of the job. I got to read a lot of interesting science from a range of different places, and worked with some highly motivated people. It’s a steep learning curve, and tends to be consistently busy; papers are always coming in, so there’s always a need to keep working. Perhaps I’m biased, but I’d also suggest that scientists could work as editors at almost any stage in their careers, and it offers a neat place between the world of academia and science communication, which I found fascinating.